Titanic - The Fatal Voyage - NEWSFLASH! 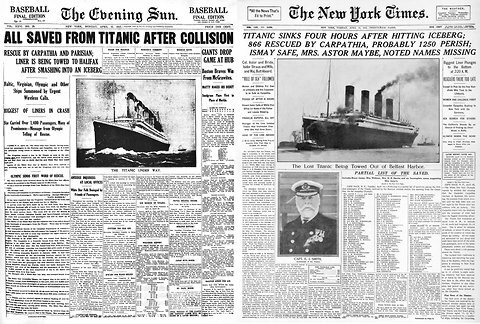 Confusion was uppermost when newspapers reported early stories of the Titanic disaster. Some headlines proclaimed that everyone was safe. Other headlines were closer to the facts. Images online, courtesy Library of Congress. In the days before instant news, people learned about tragedies from the newspaper. Journalists, ever eager for a sensational scoop, pressed for the story. But while the survivors were still at sea, no one could be sure what had really happened. Confusion, caused in large part by conflicting telegrams from ostensibly knowledgeable sources, ruled the day. Three examples make the point. The next, at 5:26 a.m., says that Titanic is proceeding to Cape Race (about 400 miles from the place where she rammed the iceberg) and that all passengers were transferred, most likely to the Virginian. One can only imagine the horror caused by the third telegram - at 10:15 a.m. on April 15th - advising Titanic had "foundered" with only "675 souls mostly women and children saved." Newspapers went to press without full knowledge of what happened. Speculation ruled the day. The Court, having carefully inquired into the circumstances of the casualty, finds, for the reasons appearing in the annex hereto, that the loss of the said ship was due to collision with an iceberg, brought about by the excessive speed at which the vessel was being navigated. Bos, Carole "NEWSFLASH!" AwesomeStories.com. Mar 01, 2004. Apr 23, 2019. Should Journalists Only Report Facts? Is Publishing Inaccurate Information Ever an Acceptable Risk? Should Consequences Apply in Cases of Inaccurately Reported News?